Lots of chatter lately about ultras offering prize money and Ultrarunner of the Year and elite this and elite that. Blah blah blah blah… While I have tremendous respect and admiration for the fastest guys in the sport, without the 99% percent of the rest of the people out there, including runners and volunteers, there wouldn’t be much of a sport. There wouldn’t be very many, if any, events. There wouldn’t be many, if any, sponsors. I, as an RD of a single race, don’t want to lose sight of that. I think the most successful races in the future, just like the road racing circuit, will be those that are able to balance catering to the elites with offering a memorable experience for the other 99%. These events won’t pop-up overnight because of a large prize purse. It takes years to develop the community passion and support around an event. Sure, there may be leaders that have more influence and can get events up to a successful level sooner than others, but if they lose sight of the 99% I don’t think they’ll have much of a future. The Waldo race report I wrote for the October issue of Ultrarunning Magazine exemplifies this idea. Peter Fish is my hero. 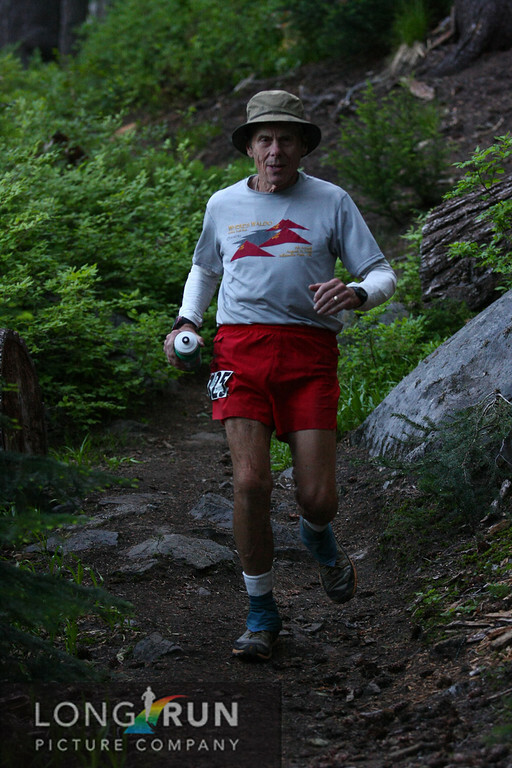 It’s 11:22 p.m. and we hear on the radio that Peter Fish, 75, and his entourage have turned off of the Pacific Crest Trail and are 1/3 of a mile from the finish line at Willamette Pass Ski Area. He’s got a total of six people with him, including his son/pacer, two sweeps, two Maiden Peak monitors and a roving paramedic who is coming in with the last runner. The oldest Waldo finisher in the race’s history had been out since 3 a.m., and while he doesn’t get a finisher hat, he does get a finishing time of 20:25 and the applause of a small but genuinely enthusiastic and excited group of people. 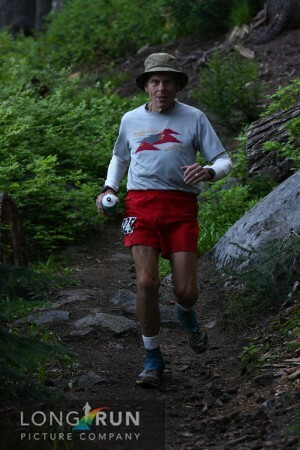 75 year old Peter Fish coming down Fuji at Waldo. Photo by Long Run Picture Co. Almost 9.5 hours earlier, the Waldo winner and new course record holder, Dave Mackey, crossed the line — followed by 89 other runners who earned hats or visors by finishing before 9 p.m. By the time Fish came in, the prize money and awards had been given out, and most runners had gone back to their hotel rooms or tents, but still, somehow, the finish line at Waldo managed to continue the ten-year tradition of rewarding all finishers. Fish and his “friends” had warm food and a fire waiting for them – as per Waldo protocol, the BBQ doesn’t close until the last finisher and final volunteers come in. Waldo, formerly Where’s Waldo, has come a long way in the decade since the race started. From the inaugural event in 2002 when only 15 of 39 starters made it over the three peaks and dozens of lakes to the finish to this year’s running, which saw the advent of live runner tracking and social media updates that actually worked the way they were supposed to, this race has grown a lot and seen a lot. In 2006, Krissy Moehl won the race outright, in 2007 there was deliberate sabotage of our course markings and a second outright female winner in Meghan Arbogast, and in 2009 the race began its first year of inclusion in the Montrail Ultra Cup. During the last three years, the race has seen more national exposure and top-level competition, and Waldo’s army of committed volunteers has continued to improve its precision, making Waldo one of the best organized races in ultrarunning. With a limit of only 125 runners, mostly due to remoteness of several of our aid stations, Waldo filled to capacity this year in 34 days and attracted runners from all over the country. Unless you were hoping for more drama, the fast folks did not disappoint. Runner tracking through ultralive.net, plus tweeting, and blogging, allowed fans to see Mackey, 41, take the lead at the gun without ever looking back. For the first time in the race’s history, there was snow on the course and we weren’t sure whether runners would be slowed by trail conditions. With splits from Erik Skaggs’ 2009 course record performance written on his arm, Mackey quickly put an end to speculation that it would be a slow year. He bounced around between one and seven minutes ahead of Skaggs’ splits all day, finishing in 9:06:51 – a new record by a little over four minutes. The common report from all over the course was that the California masters runner never looked like he was working – just out for a jog. The race for the next spots, which would earn the second and third place finishers entry into 2012 Western States 100 (assuming Mackey won, since he already had secured his WS spot), was much closer, as the next nine runners were within 18 minutes of each other at 32 miles. Ian Sharman, the man who ran 12:44 for 100 miles at Rocky Raccoon this year and who now lives in Bend, Ore., moved up in the field all day, but was unable to reel in the determined Mackey. Sharman finished second, 36 minutes in arrears. Third place, and the only new WS male spot earned this day, went to Nick Triolo from Portland. Fourth and fifth places weren’t decided until the descent down Leap of Faith off Maiden Peak where Canadian Chris Downie, a relative new-comer to ultrarunning and a late addition to the race, passed a struggling Yassine Diboun from Portland, Ore. They held onto those positions to the finish. Downie was only 13 minutes shy of grabbing a coveted WS spot. The women’s race was similar in that Vermont’s Aliza Lapierre led from the start and never looked back. She was 12th overall at 32 miles and picked off the male carnage one by one over the second half of the course until finishing with her beautiful and graceful style in sixth overall. Her time of 10:33 is the second fastest at Waldo – Joelle Vaught still holds the course record of 10:23. The race for second and third, both of which would get WS spots because Lapierre had already earned her spot, was between Darla Askew of Bend and Denise Bourassa of Idaho. They were within minutes of each other all day with Bourassa finally pulling ahead for good on Maiden Peak. Bourassa would be the last runner to dip under 11 hours and both women finished in the top ten overall. Roxanne Woodhouse, from California and Wendy Wheeler-Jacobs of Washington state rounded out the top five women. But Waldo is not just about the fast runners. We have an early start of 3 a.m., which gives slower runners an extra two hours to finish before 9 p.m. and earn the same coveted Waldo finisher hat or visor that the 5 a.m. starters have to earn in 16 hours. More than 30 percent of the field took the early start this year. We have an award called the Show Us Your Waldo, which goes to the runner who displays the most or the best “Waldo.” Aid stations turn in their ballots and the runner with the most votes wins – the prize being a comp entry into next year’s race, some high value schwag, and the unique perpetual hat that winners must bring back the following year with their own interesting contribution. Up until this year, no winner of the award has managed to come back and finish, let alone win the award again. This year, 2009 winner Leif Rustvold sought to “bring a finish back” to the Show Us Your Waldo winners and embarked on a Joseph Campbell-style hero quest involving a cursed hat and Waldo-themed lyrics put to recognizable songs. He beat out a runner from Alaska who carried smoked salmon with him and presented some to each aid station captain and out performed another competitor who read unique poems to each aid station crew to take the title for a second time in three years. Waldo is not just about the competitors. There are more than 175 volunteers from all walks of life, most of whom are not runners. With the ten year anniversary, we saw some retirements, including co-RD Curt Ringstad who has given up ten summers of canoeing, backpacking and camping to prepare the course for race day. We are truly grateful to Curt for his contributions. Waldo is an active steward of the trails we use, and the race is a benefit for Willamette Pass Ski Patrol, a nonprofit that provides free medical care to injured skiers, snowboarders and mountain bikers. 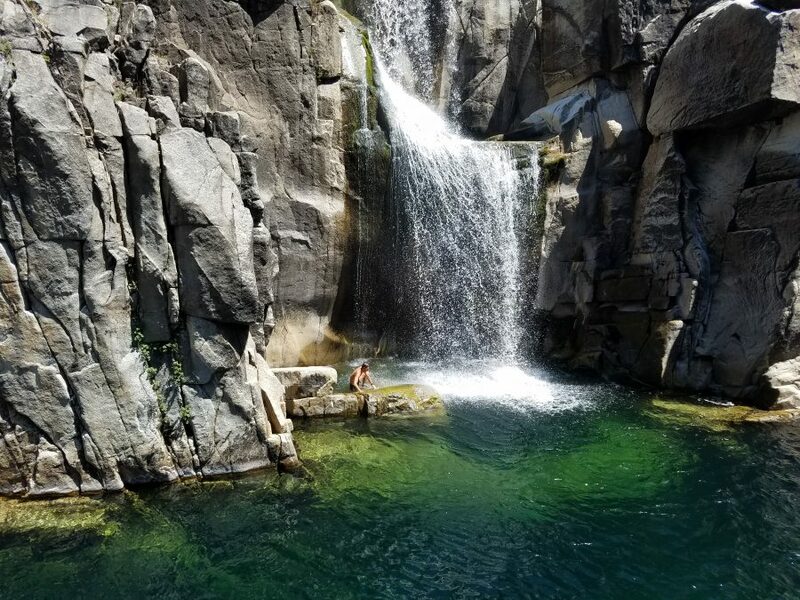 Whether you are Dave Mackey, Peter Fish or somewhere in between, Waldo is about providing an opportunity for you to enjoy 62.5 miles of some of the best single-track Oregon has to offer. It’s about passion for the sport of ultrarunning, love of the outdoors, being part of a community and giving something back. Maybe it’s fitting that this race changed its name to something that sounds less like a children’s character and more like a person. After ten years, Waldo feels more like a living, breathing organism than a competitive event. The race has taken on a life of its own. Accurate and succint, so very true! Gary, are we ever gonna see you run another Waldo? Even if you’re not running, sure would be fun to have you and Lynno come over again. I’d love to tackle the new course someday and will once I stoke the fire! As a younger, more gifted runner, I’ve had the privilege of being a part of that “one percent”* for a big chunk of my run career. But since my start in ultra running 51.5 weeks ago, I’ve been inspired (if not awestruck) by the 99% the lion’s share of the time. Say what you will about the logic of ultra running (from either a philosophical or medical viewpoint), but what makes this sport so cool is not the “Substance of Competition” amongst the 1%, but the “Communion” — the sharing of commitment, pain, perseverance and triumph. As for Peter Fish: Anybody read his training build-up for Waldo? The guy ran 60mpw with 5000-8000′ in hills! I question if anyone else in the race trained as long (in hours/week) than he did! Here’s the link to Peter’s Waldo race report that included his training leading up to the race. Yes, please, lets not loose sight of 99%. Too much talk lately about prizes for speed and hard training, as if the other at least 50% of the 99% don’t train hard. Blessing is good and all, and it’s fun and all, but going for a run is a choice we all make same, and prizes are good, but the sole focus it should not be. Olga, I’m not prepared to tell anybody what they should or shouldn’t focus on. I am just expressing my opinion that the successful races of the future will be those that find the right balance between catering to the elites and providing the experience for everybody else. As for judging people on something subjective like who trained harder than whom – that sounds like an intractable task. Let’s face it, in any individual-aggregate competition, whether a tennis tournament or a running race, there will only be one winner and 100 or more losers. But that’s only if we accept the standard and “unloaded” definitions of winner (one who beats all) and loser (one who was beaten by one or more of the other contestants). By “unloaded” I mean that the word “loser” has none of the baggage of “choker,” “not good enough,” “second-rate,” “bench-warmer,” etc. Just not the first across the finish line or just not the winner of the last tennis shot in the match. Think about this truism: “In a game of losers, the biggest winner is the best loser.” What does this mean? What can it mean to be the “best loser”? Well, in a tennis tournament, a player who plays one good (1st round) match and then tanks the next one, is a “worse loser” than a player who plays one good match and loses the 2nd round in a third or fifth set tiebreak, having been within a stroke or two of winning, even though they both exited in the 2nd round. A player who advances through the first rounds to the quarter finals and then loses, is a loser, but he is a better loser than those who exited in the first round. A finalist “loser” is a better loser than the quarter finalist loser. But there are other ways to lose. There are all sorts of metrics for determining a “good loser” and “bad loser” and most of them have to do with preparing to the utmost beforehand and then executing to the utmost during the contest. As for me, facing Waldo only 46 weeks or so into this adventure of trail-running, I realize that I did half of it pretty well by my standards. Not knowing exactly how much prep and pain it might take, I know now that I could have / should have trained more, and trained more specifically to the task. Short formula, Doug doesn’t make the rules for Waldo, Waldo makes the rules for Waldo. But limited by what I had done in prep phase, doing the blown-quad shuffle from Twins 1 through Charlton to 4290, and bowing out at mile 37 was the utmost of my ability for that day. (Of course, the day after I began to think I should have pushed on to Twins 2, even if I just crawled . . .) As part of the 99%, I’m okay with my performance, and already doing better prep for the next one, where I plan to be a “better loser,”–the 10 hours and under folks have nothing to worry about from me. Will I finish, will I get a hat? I don’t know. Will I do more in prep, and more in planning, the next time around? Yes. Doug, are you suggesting we’re all a bunch of unloaded losers? I think you’re a winner today because this is the first time akismet didn’t think your comment was spam! Yeah, next year you need to listen to the Queen’s advice about training for Waldo. Well, it’s a sad fact that when you ask “Who won Wimbledon?” this year, even though the brackets filled with 128 names in the men’s singles division at the start, only one name–Djokovic–is the right answer. One winner, and 127, er, well, losers. 1% (actually less) and 99%, even at the highest level of a very high profile professional sport. So, the question for statistically everyone in any sort of competition is how to win while losing. Not only am I going to take Meghan’s advice about training, but I’ve actually been to the track 3 times in the last 3 weeks to do intervals. There was a lot of inspiration on the trails for me last August. This is a great post on several levels. First, it is a tribute to the race you and Curt birthed and has become part of the lore of ultrarunning. Next, it’s a nice, not over-the-top commentary of what makes the sport special. Then, it’s a tribute to two extraordinary guys, Dave and Peter, who really get it. And finally, it’s an honest reflection of the kind of guy you are. And that, my friend, is what it’s all about. geez. Anybody gotta kleenex ? Thanks for Waldo, one of the best experiences of my life. All the hard work and care you and all the folks who have a hand in making Waldo happen really shows. Waldo will be one of the races that stand the test of time because of this. I just reread this post and love it. There are lots of stories out there on the trails – not just the fast ones. My favorite thing you wrote, tho, was about the Waldo commitment to not closing down the finish line or the BBQ until the last runner is in. That means SO much to a person who’s been out there all that time. I’ve experienced coming in with seconds to spare to a dark finish line and nothing but some leftover a/s food – it was very demoralizing. Peter is an amazing guy and I’m glad you were all there to appreciate that!